As one of the leading water heater brands in Singapore, Ariston is known to pioneer state-of-the-art technologies. 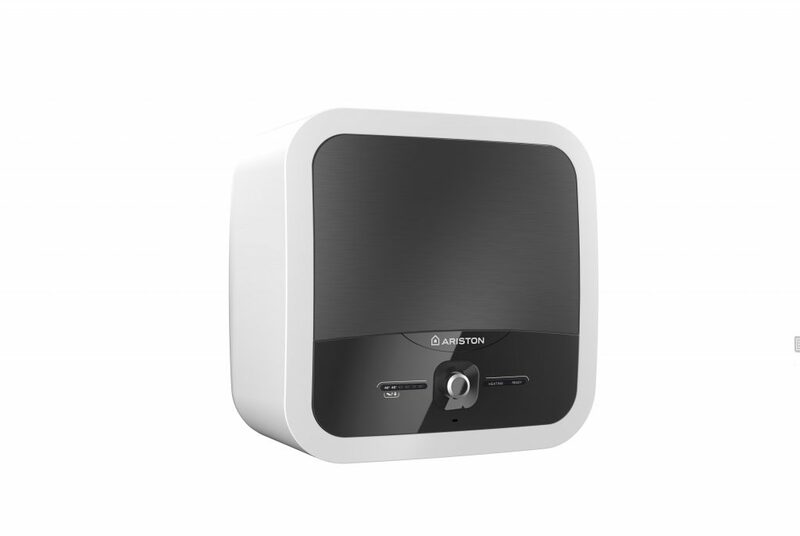 In 2016, Ariston launched Singapore’s first Constant Temperature technology in its AURES instant water heater range. 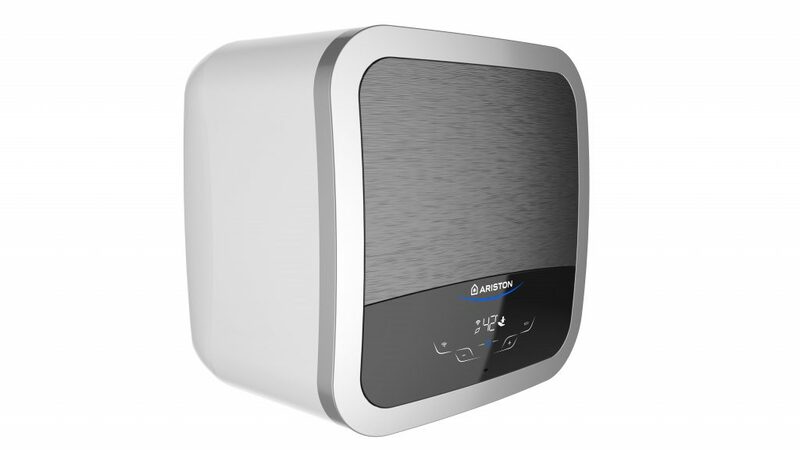 In 2017, Ariston introduced the first SLIM storage water heater in Singapore. Today, Ariston proudly announces its whole new technology in storage water heaters through the Ariston Andris2 range. This newrange of Andris2 storage water heaters are equipped with revolutionary smart technology, renewed luxury design and patented titanium heating element.The Andris2 range includes the models Andris2 Top, Andris2 Lux and Andris2 RS. The whole new Andris2 range comes with the following patents, allowing this range to stand out from other models in the market. 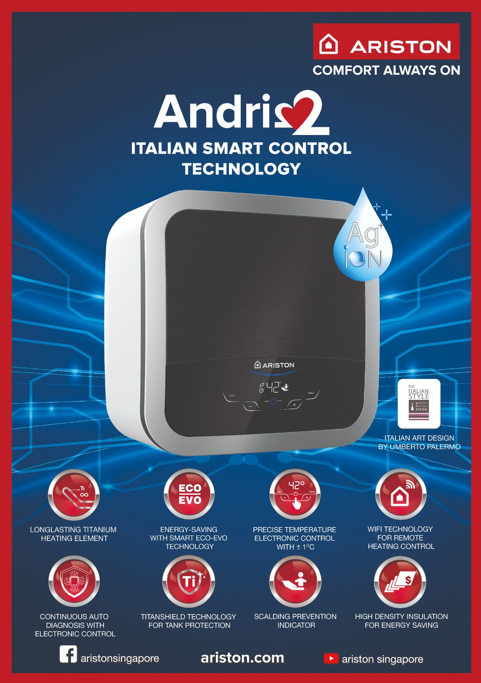 The premium Andris2 Top model (below) is the firstWi Fi-enabled storage water heater in Singapore with dedicated app controls.With Ariston’s first-in-the-marke remote control Aqua Ariston Net App for water heating, you will have total control whenever and wherever you are. Connecting you conveniently with your Andris2 Top smart water heater, comfort and energy savings are now at your fingertips. Enjoy an absolute peace of mind together with savings up to 25% (estimated savingson daily basis, compared to Ariston standard mechanical product) with this new Smart Control Technology. Hot water is now available, whenever you want. The integrated auto-learning software ECO EVO installed in Andris2 Top learns your habit day after day and is able to recall your daily habits to deliver hot water right when you need it. ECO EVO is the most innovative energy saving algorithm used worldwide by Ariston to reach the top energy ratings. 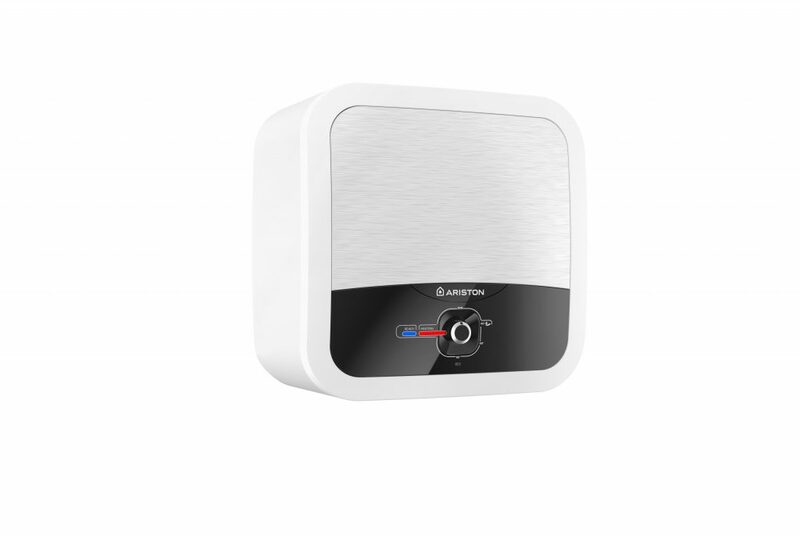 Alongside Andris2 Top, Ariston is also launching two new models, Andris2 Lux (below) and Andris2 RS (bottom photo). While all Andris2 models offer a superior temperature control, the smart Andris2 Top and Andris2 Lux models use a brand-new powerful chip to constantly measure the water temperature. Ariston has always prided itself in developing durable products that last through time. 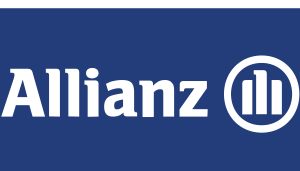 It was the first water heater manufacturer to use titanium against water corrosion. Today,all Andris2 models are made with super-ecologic insulation materials and boast a new exclusiveTitan shield technology for best tank protection with titanium enamelling and enhanced Mganode. The patented full-titanium heating element is the best solution in the market which assures top heating performance during the whole product life. To prove product durability, this unique component in Andris2 Top & Lux range comes complete with a lifetime warranty. Beautiful, clean and modern lines define the Italian design by renowned art designer Umberto Palermo. Possibly the best-looking water heaters out there, the Andris2 range comes in aesthetically pleasing monochrome colours that will look stunning in any bathroom. The sleek and minimalistic design does not take up too much space in the bathroom, a great trait especially since bathrooms are now getting smaller. After all, a compact water heater means a less cluttered and a more spacious bathroom.